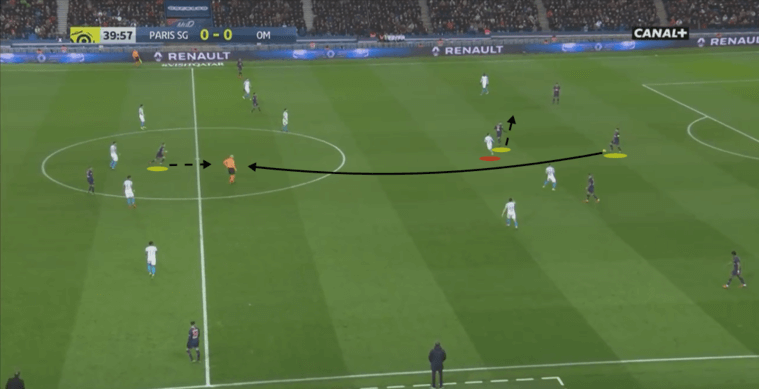 Home Match Analysis How did PSG manipulate Marseille’s midfield en route to winning? Following their dramatic Champions League exit at the hands of Manchester United, PSG’s season will likely be seen as a failure regardless of what happens from here on in. However, with 70 points on the table and 10 games remaining, the Parisians do have the opportunity to break the 100-point mark in Ligue 1. Their opponents on Sunday, Marseille, are fighting for a spot in next season’s premier European competition. Despite sporadic moments of quality, they left the capital with nothing to show for their efforts. 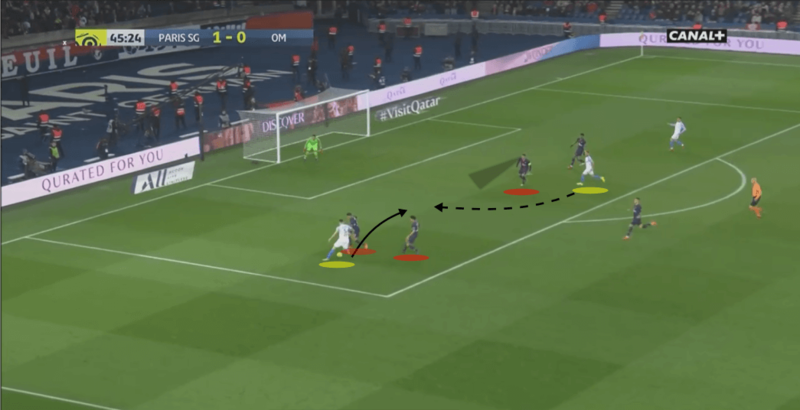 This analysis will dissect how PSG managed to secure all three points. Still without the injured Neymar and Cavani, Thomas Tuchel elected to pair Kylian Mpabbe with Angel Di Maria up front. 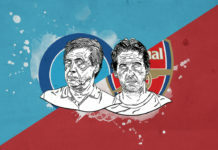 Both had license to vary their play between dropping off to link up with the midfield, and threatening the space in behind Marseille’s defence. Marco Verratti rotated with Leandro Parades in the pivot role, while Dani Alves occupied the right half-space. Layvin Kurzawa and Thomas Meunier played in advanced wide berths. Rudi Garcia decided to line-up in a flat 4-4-2, hoping to gain ground on the counter-attack through dribbling wide-men Florian Thauvin and Lucas Ocampos. Former Manchester City and Liverpool forward Mario Balotelli was joined by Valere Germain in attack. With Thauvin moving in-field on occasion, Bouna Sarr was the more attacking of the two full-backs, while Hiroki Sakai generally stayed deeper. 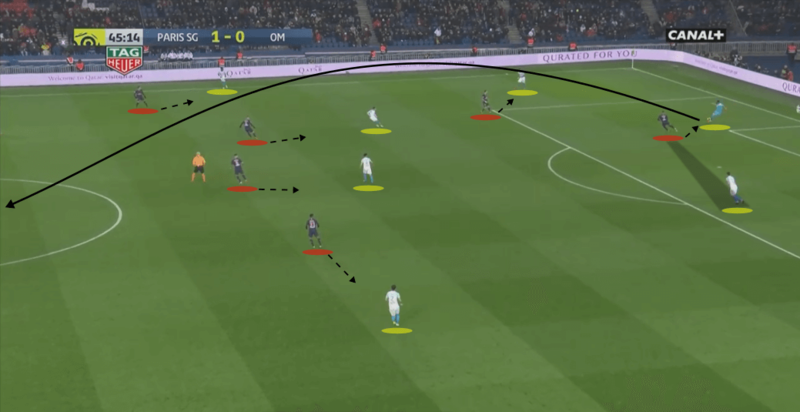 With Marseille often setting up out of possession with two lines of four behind the strikers, PSG had to be creative in breaking through the centre. 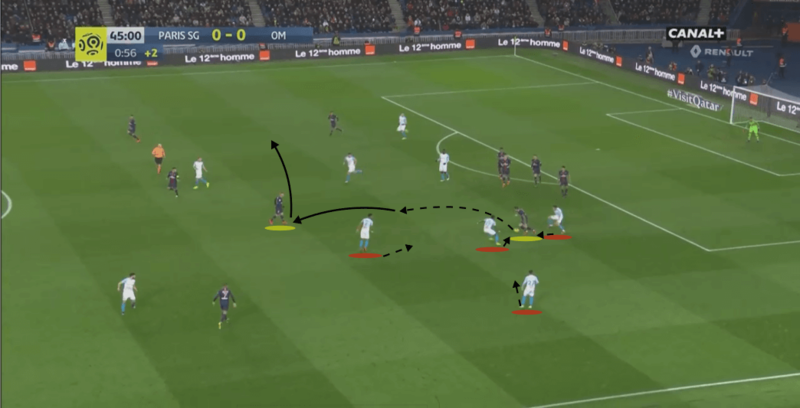 Verratti and Paredes were both marked closely when looking to receive in the midfield, and the Parisians took advantage of their visitor’s approach in a number of interesting ways. One method they used to create openings involved the midfielders taking up decoy positions. Having scanned over their shoulders to see where the attackers were, Verratti and Paredes often moved opponents with their movement and positioning in order to create direct passing lines from the first line of attack to the last. The image below illustrates this. 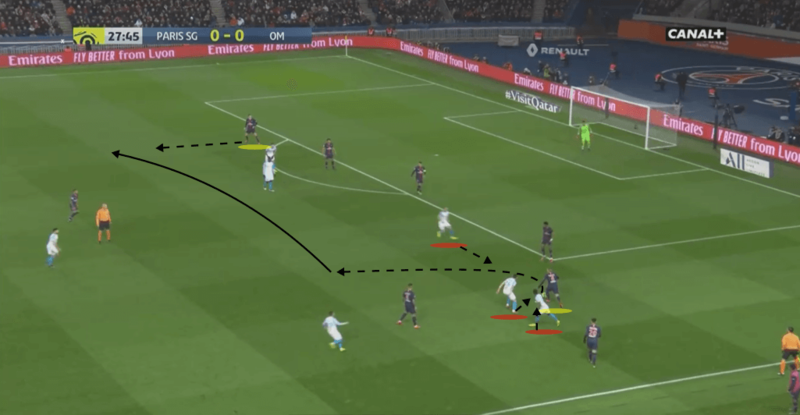 Recognising the space behind Marseille’s midfield, as well as the location of the PSG forwards, Paredes moves to the side, dragging Germain across in the process. In this instance, Germain had swapped roles with Maxime Lopez, who had moved up to follow Verratti. Paredes’ decoy movement opens up a passing lane from Thiago Silva to Mbappe, and the Brazilian centre-back picks out his teammate between the lines. Mbappe has time and space to receive before driving at the Marseille defence. The next image provides another example of this tactic, this time with Verratti exploiting the close marking of Lopez. Again, Verratti scans the space behind him before moving off to the side. Lopez follows him, assuming the Italian is trying to find space to receive. Silva, who played the role of quarterback throughout Sunday’s encounter, plays a direct pass through the open lane towards Di Maria. The Argentine drops off the front line at the last second to receive in space, before turning and dribbling towards the final third. 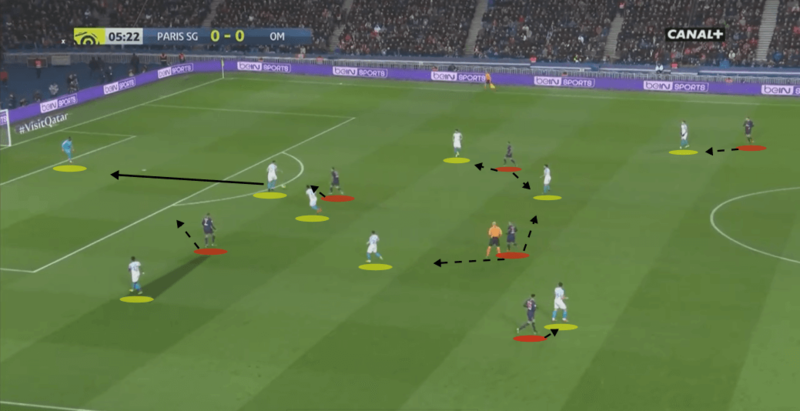 Another interesting way in which PSG’s midfielders looked to disorganise Marseille’s midfield line involved the use of rotations. 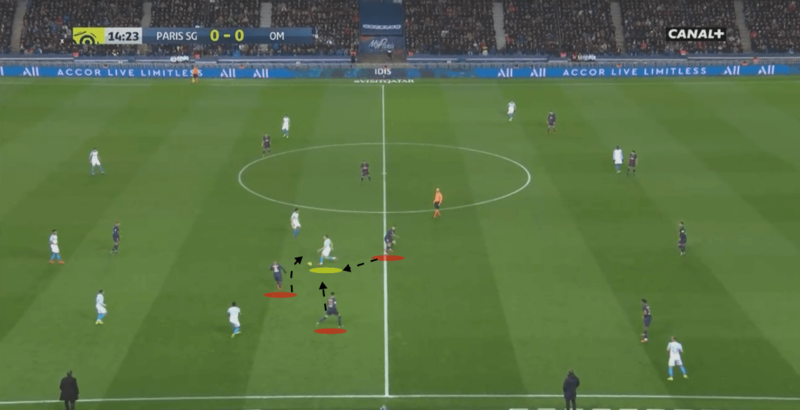 As mentioned earlier, Paredes and Verratti regularly swapped roles in the centre, with one advancing slightly further forward and to the side, while the other dropped into the pivot space to receive from the back three. Prior to the moment shown below, Paredes had left the pivot role and allowed Verratti to drop in. Lopez follows him, again creating a gap in the midfield line. Verratti receives possession and draws pressure from his marker, before engineering his way past him and exploiting the broken line with a pass through to Di Maria. 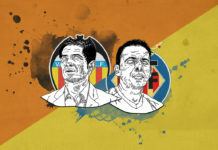 It highlighted the flaw in Garcia’s plan to task Lopez with the strict man-marking of Verratti. Germain was occasionally too slow in making cover runs back into the midfield line, leaving gaps for PSG to play through to the attack. Particularly during the first half, PSG consistently found creative ways to disjoint Marseille and create openings through to the attack. Di Maria and Mbappe were able to receive between the lines far too often, with Meunier and Kurzawa being fed in advanced spaces down the sides. The home side were forced into two substitutions before the break following injuries to Meunier and Alves, with Thilo Kehrer and Colin Dagba taking their places. 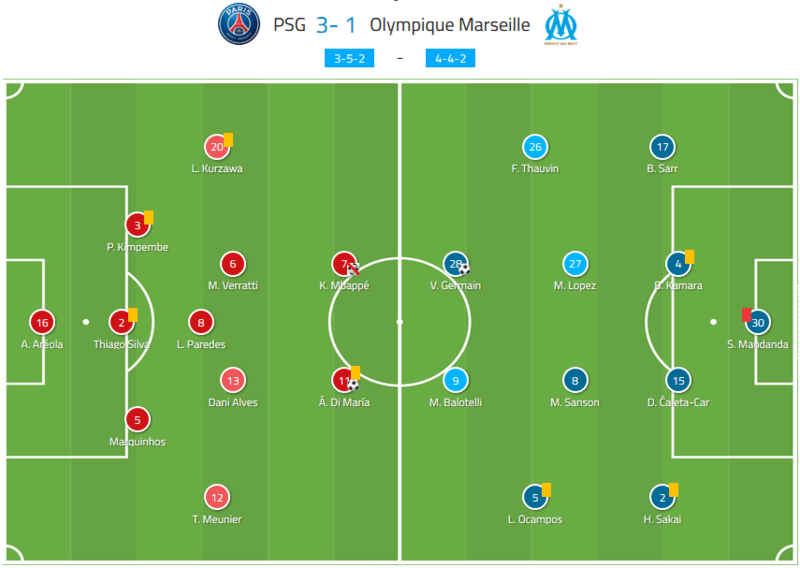 Mainly thanks to the ball-carrying abilities of Ocampos and Thauvin, Marseille did manage to break their way into PSG’s defensive third on occasion. However, they only managed to register three shots on goal due to the quality of defending, especially from Thiago Silva. 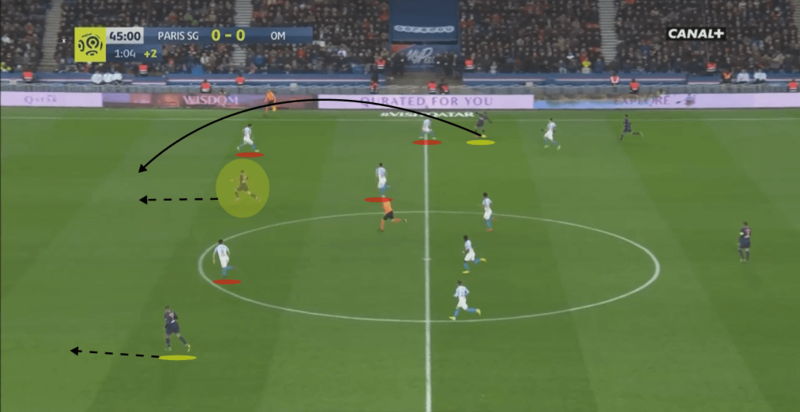 Whenever they lost possession high up the pitch, Marseille applied aggressive counter-pressure in an attempt to prevent their hosts from exploiting them on the break. But Verratti, often the one to achieve the turnover, was typically adept at resisting the pressure before setting his team away on the counter-attack. The image below illustrates this. Having recovered the ball from Sarr on the right wing, Verratti protects it while dribbling past two Marseille players. Germain arrives at pace to close him down, but the 26-year-old skips past him before driving into the space. He picks out Meunier in the right-hand channel, and the Belgian full-back carries the play into the opposition half. It wasn’t the only occasion Verratti used his ability to dribble out of tight spaces to the benefit of PSG’s transitions from defence to attack. The reward for bypassing the counter-press was an abundance of space to exploit behind Marseille’s midfield. Another player who excels in tight spaces, Di Maria also used his dribbling qualities to exit pressure during these transitional moments. The sequence below shows the build-up to PSG’s first goal, coming just before the half-time whistle. Following a corner kick, the home team clear the first ball out to Mbappe outside the penalty area, who heads it down towards Di Maria before sprinting forward. The space around the former Real Madrid man is closed out quickly by surrounding Marseille attackers, but he somehow manages to escape the pressure. 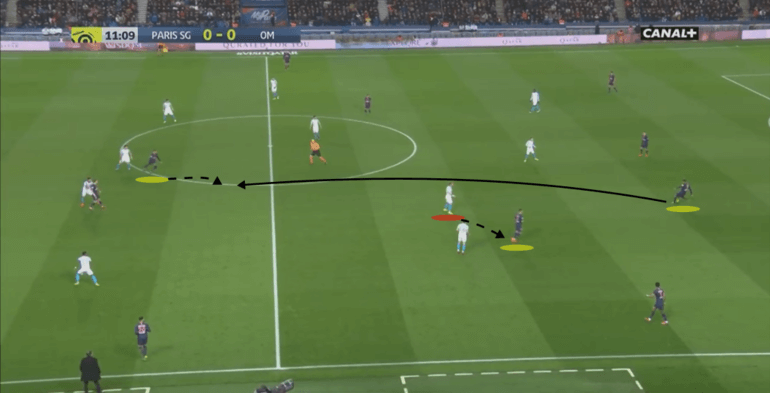 Having engineered an exit route from the crowd of defending players, he moves the ball on to Verratti, who can then play the out-ball towards the space on the wing. Despite the initial efforts to ensure his team could counter, Di Maria sprints forward to receive in behind from Kehrer. He then slips in Mbappe, who calmly slots home his 26th league goal of the season. PSG’s ability to resist moments of intense pressure from their rivals played a significant role in their success on Sunday. Verratti and Di Maria were calm and confident in playing their way out of congested areas before exploiting the space left in the attack. Di Maria’s close control was also exploited for the second goal on the night, with the attacker breaking through a crowd of defenders before slotting past the keeper. As Marseille looked to build attacks out from the back, PSG deployed a high press to stifle their efforts. It often left them resorting to hopeful long passes towards Balotelli. The image below highlights the level of pressure applied by Tuchel’s men from the start. Wing-backs Meunier and Kurzawa stick to Ocampos and Thauvin, with Verratti and Alves playing between the central midfielders and the left-back during Marseille’s build-up phase. Mbappe retains access to both the right-back and the right central defender, with Di Maria applying pressure to the central defender in possession on this occasion. Duje Caleta-Car is forced to pass it back towards Mandanda, whose loose touch almost ends up in the back of the net. While the pressure generally prevented Marseille from building sustainable attacks, it did result in their equaliser immediately after half-time. With PSG going man-for-man, Mandanda is pressured by the angled approach of Mbappe. His long ball isn’t dealt with, after Balotelli holds off Marquinhos while dummying the header. The ball then bounces over Kehrer, with Ocampos running beyond the young defender to recover it. Kehrer manages to get back goal-side, while additional support arrives from Marquinhos. However, Ocampos still finds a way to get a cross in, with Germain arriving from out of Silva’s line of vision to drag the shot into the far corner. PSG’s sloppy start to the second half cost them a cheap goal, but Marseille did well to take advantage. Following their own losses of possession, PSG matched their opponents in applying aggressive counter-pressure. The instance below illustrates an occasion where the counter-press was successful. After Paredes had been dispossessed by Thauvin, Verratti joins him and Kurzawa in closing out the space surrounding the ball-occupant. Once again, Verratti achieves a turnover, before driving into space with the ball. His through-ball is met by Di Maria’s positive run in behind. The 31-year-old chips the ball past Mandanda, but the goal is correctly marked offside. 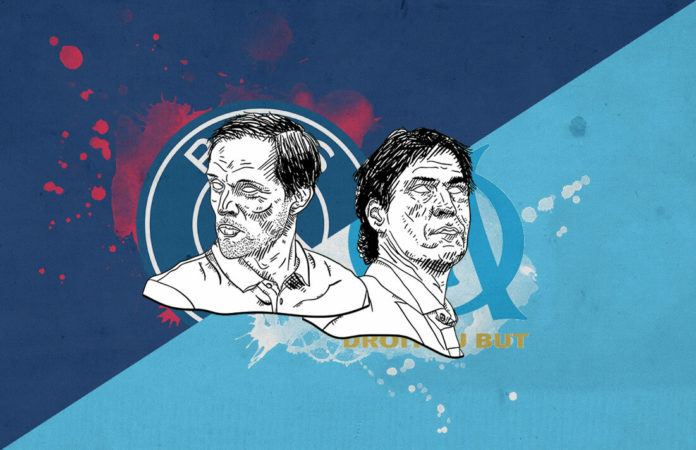 Overall, PSG’s pressure, as well as their ability to retain possession, meant that Marseille could build little in the way of quality attacks. The home team enjoyed 62% possession, and only allowed their visitors an average of 8.34 passes before a defensive action was completed. In comparison, Marseille ceded an average of 16.24 passes before dispossessing their opponents. PSG recorded nine shots on goal, with an expected goals tally of 1.47. Their xG over-performance is partly down to the nature of their third goal. Di Maria had broken in behind the defence yet again, before Mandanda handled the ball outside the area. The French shot-stopper was sent off for the foul, before Di Maria found the top corner with the resulting long-distance free-kick. Thanks to the brilliance of Di Maria and Verratti in particular, PSG were able to run out comfortable 3-1 winners on the night. Their bid for the Champions League title has been put on hold for yet another year, but a strong end to the season should see Thomas Tuchel earn another chance next term. Marseille remain in the top four despite losing, with St. Etienne now just a point behind. 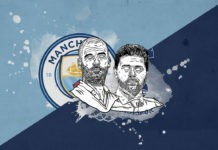 Mario Balotelli and Florian Thuavin will need to continue sprinkling stardust on the Stade Velodrome if they are to stave off the competition. Next articleHow did Fabinho conduct Liverpool’s exploitation of Fulham’s compact shape?